When I came to US, one major difference I found here was the love for Coffee over Tea. While Tea (Chai) dominates Coffee in India, it is hard to find Tea lovers in US. I once read in Wikipedia that after water, tea is the most consumed beverage in the world. That sounds good! It’s hard to resist Coffee from places like Star Bucks, Dunkin Donuts and other coffee houses when they have so many different varieties of Coffee. Many people like Cinnamon spiced Coffee, though I am not a great fan of Cinnamon in my Coffee. 🙂 My husband likes it and I ended up making it for him. I make Coffee at home without espresso machines, steam wands and other devices. You will probably need all those devices for making a Coffee House style cappuccino or latte. 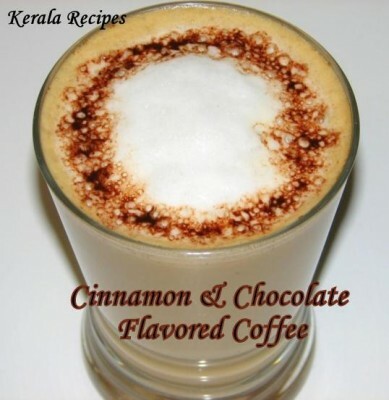 Here is a recipe for a nice Cinnamon & Chocolate Flavored Coffee. I know many Indians will be surprised with the addition of Cinnamon (Patta) to Coffee. Don’t be surprised as this is similar to adding Cardamom or Ginger to you Tea. So enjoy this coffee. This recipe serves 2. Microwave the milk with sugar for around 2 minutes. Blend the milk for around 2 minutes in a blender until foamy. Next, microwave the water for another 2 minutes. 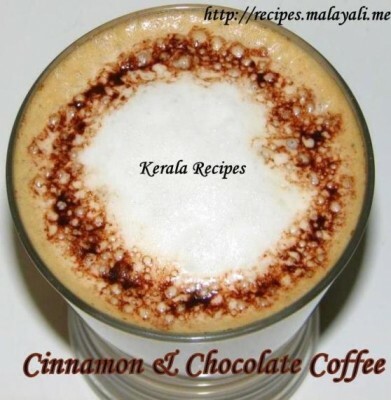 Add instant coffee powder and cinnamon powder to the cup of water to make Black Coffee or Espresso. Stir well. Divide the black coffee into 2 cups. Pour milk slowly into both cups. Top it up with foam from the milk. Sprinkle chocolate powder on top of the foam. Enjoy your coffee. cool, ill totally try this. my sis hates coffee, so ill make this! thanks!! !